It is because of the wonderful generosity of the SPSL community that we are able to maintain our commitment to academic excellence through small classroom sizes, excellent teachers, robust facilities, and the latest technologies. Every dollar donated is critical to our mission. Click the PayPal link below to make a tax-deductible donation to our school. 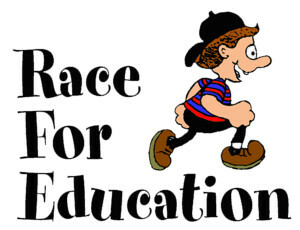 Mark your calendar for Friday, April 26 for our annual Race For Education. Click here to learn more about this fundraiser. To view the Race day schedule, click here. On Saturday, May 18, SPSL will host our annual Golf Tournament. It will be held at The Knolls Golf Course with a 1:00 pm shotgun start. You can download our sponsorship brochure or golfer registration form here. Want to learn how the every day things you do – eating, reading, traveling, surfing the web, shopping, can earn money for St. Pius X / St. Leo School? Click here for a list of all our on-going fundraisers. Each month we will spotlight a few of our fundraising efforts. This month we encourage you to take a night off from making dinner and join us at a Restaurant Night. Please read this Restaurant Night primer for more information. The next time you shop on Amazon.com, make your purchase on AmazonSmile. AmazonSmile has the exact same low prices, vast selection, and convenient shopping experience as Amazon.com with the added bonus that Amazon will donate a portion of the purchase price to your favorite charitable organization. Remember to register to support St. Pius X/St. Leo School. Use this link to reach our school page: http://smile.amazon.com/ch/47-0424937. TAGG (Together A Greater Good) is a free mobile app that when used at over 80 local businesses, the business will donate back to SPSL. All you need to do is download the free app (Together A Greater Good), choose St. Pius X / St. Leo School as the organization you want to support, visit participating businesses, and TAGG your purchase. The business will donate 5% of your purchase to us! Planet Sub, located at 8990 W Center Road, will donate 15% back to SPSL on Sundays when you TAGG your purchase! Enroll your current Baker’s Plus card.